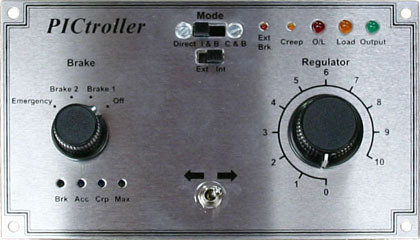 The PICtroller is a model railway controller suitable for operating with any type of 12V motor, including coreless motors such as the Portescap range. The PICtroller automatically senses the motor type and adjusts the operating parameters to suit cored or coreless motors. To do this the PICtroller generates a short pulse as the locomotive starts which also serves to overcome the initial resistance to movement and start the locomotive more easily. Three driving modes are provided on the PICtroller – Direct, Inertia & Brake and Coast & Brake. Braking rate, acceleration rate, creep speed (see below for an explanation of creep mode) and maximum speed can be preset. There are 2 brake positions plus emergency stop. Optional external inputs are provided to allow for various forms of automatic or semi-automatic operation, including initiation of braking action and forced reduction to creep speed. 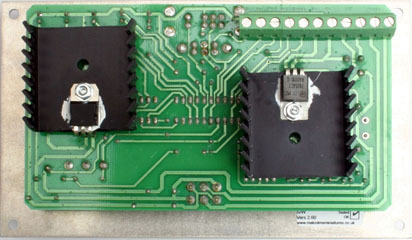 An external voltage can also be used to control the PICtroller in any of the three driving modes. 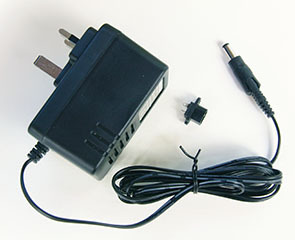 The PICtroller requires a 12-18V AC or 18-24V DC 1.5A power supply. Panel size: 158mm x 92mm - requires 40mm clearance behind the panel.